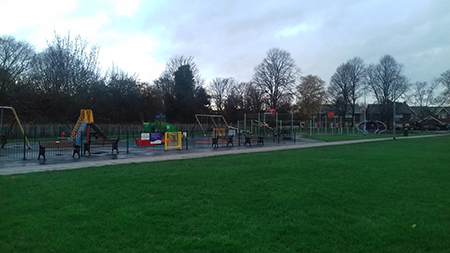 Work to transform Sytchcroft Park in Neston with a new play area and park landscaping has now been completed and is now formally open to the public. 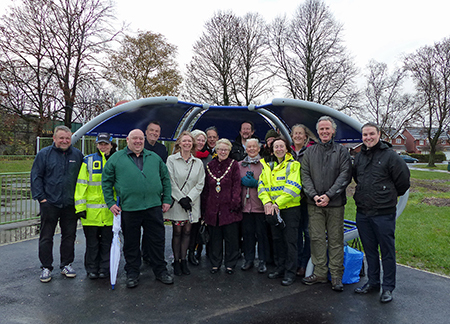 Cheshire West and Chester Council, Neston Town Council, partners, funders and contractors have been working in partnership to improve the park over the last year with a new play area, a multi-use games area, and additional footpaths and open space landscaping. The successful partnership has secured significant funding and support from within the Council, Neston Town Council, the Neston Section 106 Group, WREN Community Action Fund, Local Ward Member funding, Neston Civic Society, ForHousing, Adactus Housing Association, Tesco Bags of Help and Borderlands Railway. With the support of the funding from Adactus Housing Association and Tesco Bags of Help, a local artist has been commissioned and is currently conducting workshops with pupils from Neston High School and Neston Primary School to complete a community art project to design a site theme and be incorporated into site entrance information boards and to support the “Smile for a Mile” initiative. This work is to be completed over the coming months and examples of the children’s work will be displayed at Neston Community Youth Centre and the Town Hall. Spring Blubs have also been planted on site by children from Neston Primary School, St Winfried’s RC Primary School and Woodfall Primary School. A community celebration event is to be organised for the spring 2019 to celebrate the new park. The Council’s Cabinet Member for Communities and Wellbeing, Councillor Louise Gittins said: “The Council has produced a borough-wide Play Strategy which provides a valuable resource to those with a responsibility for managing outdoor play and youth spaces. “Utilising the play strategy, the Council and its partners have been delivering a play improvement plan over the past couple of years. The improved play area and open space at Sytchcroft has been part of this process and is a fine example of successful partnership working between the Council, Neston Town Council, funders, partners and the community.